GET MY FREE SEO CHEAT SHEET!GET IT NOW! GET MY FREE SEO CHEAT SHEET! Here are the top five local SEO ranking factors for local business to start using today & rank higher in local search results. GET THE FREE SEO CHEAT SHEET! Not sure where to start with SEO? Use my FREE SEO CHEAT SHEET to get started today and learn SEO essentials. How to create an optimized and visible presence for local customers on organic search. Every local business wants to rank well in search results — which is why it is getting harder to do so. Not only have more businesses recognized the benefits of local SEO, but also new Google features have created shifts in the importance of local SEO ranking factors that are driving local search today. The good news is that with some targeted effort, local businesses can create an optimized and visible presence for local customers on organic search. 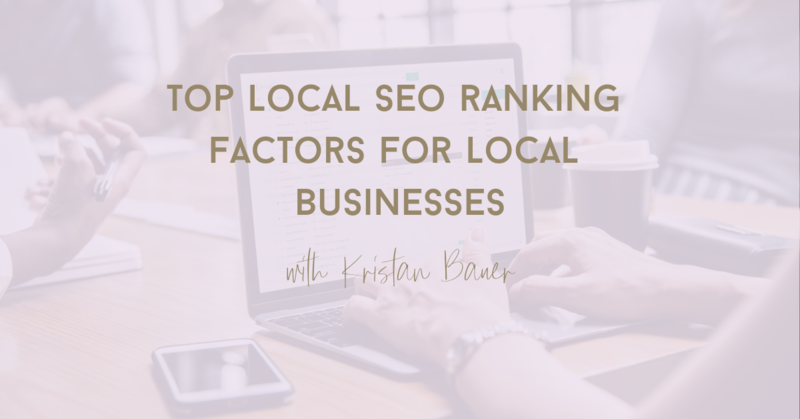 Here’s an in-depth look at the top five local SEO ranking factors for local business that you can start using today to rank higher. Backlinks (aka external links) are links from other external websites to your site. The top localized organic ranking factor, backlinks are essentially votes of popularity from other sites. They indicate that another site likes your content enough to link to it and share with their audience. Ultimately, getting links from other businesses in your local community can help provide increased localization signals and are among top local SEO ranking factors. Another important factor in ranking higher and earning more relevant traffic in search engines is on-page SEO, which includes keyword optimization. It’s critical that you not only understand what keywords people use locally to search for your type of local business but that you also use these terms when you describe your business online. When your on-page SEO optimization is on point, users find what they expect when they arrive at your site, which will increase your click-through rate, mobile clicks to call, and check-ins. Setting up your Google My Business (GMB) account is one of the best things you can do for your local SEO. GMB is a free tool that allows you to take charge of what people see when they do a local search for your business — and it’s helping local companies get more visibility (and search engine accuracy) than ever before. 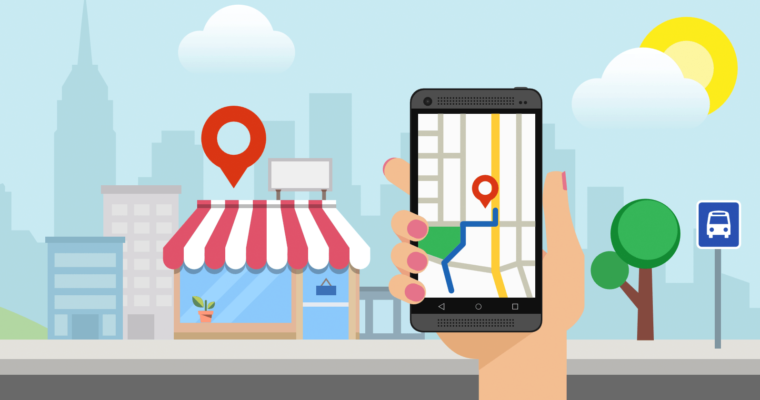 By setting up a GMB account, your business is eligible to appear in Google’s local map pack results. Add categories, photos, contact information, business hours, your website link and posts to ensure customers have important, accurate information about your business. According to a Moz survey on local search ranking factors, many businesses haven’t experimented yet with all of the GMB features, such as Google Posts and Google Insights, so now is a great time to invest in these aspects of local search and get ahead of your competition. Every time someone includes your address across the web counts as a citation for your business. The quantity and consistency of these citations are important for local SEO. Ensuring that you have consistent citations across the web is critical. To do this, pick a business name, address and phone (NAP) format and keep it consistent. Using the same name, address and phone number ensure that customers (and search engines!) know exactly what your business is called, where it’s located and how to reach you. To increase your citations, add your local business’ information to local directories, such as Yelp, Foursquare, LinkedIn, Facebook and Bing. Having current, correct and comprehensive business listings in local directories can provide more visibility in local search. Reviews are gaining importance among local SEO ranking factors for local businesses. Not only does your GMB listing allow you to communicate with potential customers, but it also encourages them to leave feedback for your business. Don’t wait for the review to roll in, though. Ask your customers to leave reviews. Following your email signature, insert links to your review sites. Go above and beyond in customer service. Respond to the reviews, too. Responding to positive reviews shows you’re grateful for their support and might influence other customers to leave their own positive reviews. Responding to negative reviews illustrates that you value your customers and their feedback. Once you have a bunch of reviews on Google, expand your focus to other popular review sites, such as Yelp, Glassdoor, Angie’s List and BBB. 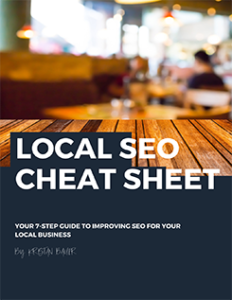 For more tips improving SEO for your local business, download my free 7-Step Local SEO Cheat Sheet to learn local SEO basics! Get my FREE 7-Step Local SEO Cheat Sheet to learn local SEO basics! 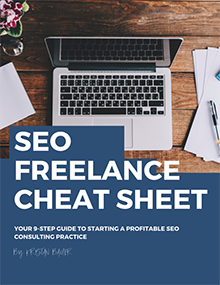 Get my FREE SEO Freelance cheat sheet to make sure you're ready to freelance! Kristan is a fantastic thought partner, consultant, and educator. She is capable of training marketers, engineers, product managers and more in SEO, from fundamentals to complex decision making. More importantly, she can help bring a cross-functional perspective so everyone is empowered and motivated to achieve shared SEO goals.